Inagh Kilnamona (Clare) v Inniscarra (Cork), Cashel, 2.30pm. Live blog on RTÉ.ie and the RTÉ News Now App from 1pm. Dr Crokes v St Finbarr's live on TG4, 1.30pm followed by deferred coverage of Clann na Gael v Corofin. Updates on all the day’s games on Sunday Sport on RTÉ Radio 1 from 2pm. There'll be sunny spells and scattered showers, particularly frequent in the western half of the country. Winds from the southwest will be quiet strong on the coasts and a maximum temperatures of 9 to 11 degrees mean we might get some hail. For more go to met.ie. We enter the business end of the championship. By the weekend's end we will know the identity of the Connacht and Munster finalists, and be down to the last four in Leinster, while the Ulster hurling title will be decided in Armagh. Aughawillan last made a provincial decider back in 1994 so an expectant and hopeful crowd will look to make their presence felt at Pairc Sean MacDiarmada. They overcame Mohill in the county final to get to this stage and will relish the chance to upset the codds. Mayo outfit Balintubbber travel to Leitrim on the back of really dogged 0-6 to 0-5 defeat of Tourlestrtane, in which Cillian O’Connor's five frees proved decisive. His brother Diarmuid scored their only point from play. They've never won a Connacht title losing the 2014 final to Corofin and can expect an awkward afternoon in Carrick-on-Shannon. In the other last-four clash, Galway's Corofin bound into a meeting with Clann na Gael at Dr Hyde Park having secured a sixth county crown on the bounce. They saw off Mountbellew/Moylough 1-8 to 0-5 and are in action for the fourth Sunday in a row. Whether that chunk of competitive fare takes its toll remains to be seen but they'll take heart from the unconvincing nature of Clann na Gael's win against Tir Chonaill Gaels. They trailed by a point with 42 minutes played but Tir Chonaill Gaels tired and ultimately pulled away to win 1-15 to 1-10 thanks in large part top Donie Shine’s unerring free-taking - he scored 0-9, seven of which were frees. It was a Dub who earned Meath county final glory for St Peter's Dunboyne three weeks ago. Stuart Lowndes - brother of Eric - hit the crucial goal five minutes from time to secure just a third title for Dunboyne, who beat Summerhill 1-11 to 0-9. Having then overcome Shelmaliers, they now get a swing at Dublin powerhouses Kilmacud Crokes, who ended an eight-year wait for the Dublin senior title when convincingly beating St Jude's in Parnell Park by 2-12 to 0-13 with as All-Star Paul Mannion superb. Moorefield won Leinster twelve months ago after a thrilling comeback victory over St Loman's and they saw off Athy to come through Kildare this year. Looking to derail them is Portlaoise, seven-time champions of Leinster. They lifted the Laois title for the 11th time in 12 years when they beat O'Dempsey's, with man of the match Ricky Maher scoring a goal in each half. Éire Óg are another club with provincial pedigree. They face Newtown Blues in Drogheda buoyed by their Carlow title triumph, earned in a one-goal win over Palatine in a replayed final at Netwatch Cullen Park. Newtown Blues meanwhile secured first back-to-back Lotuh crowns since 2001 when edging out Naomh Mairtin. Conor Branigan fired over the winning score on a day Newtown didn't play well but held their nerve with the game in the melting pot. Rhode have lost two of the last four Leinster finals so will not lack for hunger when they square up to Mullinalaghta in Tuillamore. They cruised past Ferbane in the Offaly decider and in Ruairí McNamee, Niall McNamee and Anton Sullivan, boast a clinical forward line. Mullinalaghta for their part won a third Longford crown in a row with the minimum of fuss against Abbeylara after they'd played out a dreadful draw first time out. Mickey Graham’s men were really impressive in the replay and will not go down easy. Dr Crokes warmed up for their Munster SFC semi-final showdown with St Finbarr's with a Sunday stroll past Moyle Rovers of Tipperary, who just couldn't lay a glove on the Kerrymen. 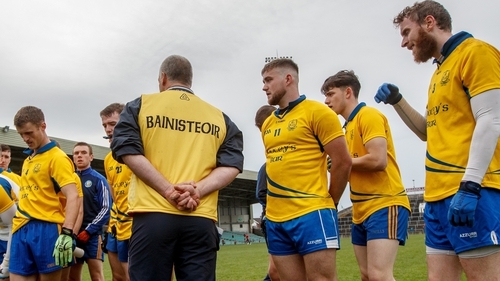 Barrs meanwhile ended 33 years of hurt in Cork when they got past Duhallow at Páirc Uí Chaoimh to end a sequence of eight consecutive defeats in the final. Captain Ian Maguire said "the Barrs warriors got their due" after that sweet success so they'll tarvel to Killarney on the crest of a wave. That being said, Dr Crokes have never lost a Munster club championship game on their own patch and are aiming to make the provincial final for the third straight year. In the other semi-final, The Nire look to maintain their momentum from a ruthless filleting of Adare last time out. Saint Joseph’s Miltown-Malbay secured their second Clare title in four years after a storming second-half showing gunned down Ennistymon. Inter-county hurlers Conor Gleeson and Shane Walsh were on song for The Nire last time out; the Waterford men will be banking on another good return from them. Down's Ballycran got a serious shot in the arm when halting Slaughtneil's quest for three Ulster successes in a row and won't fear Cushendall when they collide at the Athletic Grounds. Ballycran haven't claimed a provincial title since 1993 - when they beat Cushendall in the final - and brought huge intensity to their semi-final win. Cushendall are studded with experience and quality however and come into this having pocketed a 14th Antrim SHC title by slaying Loughgiel Shamrocks. Inagh Kilnamona of Clare could lift the Munster Senior Camogie crown for the first time in their history in Cashel, with the Rena Buckley-led Inniscarra of Cork standing in their way. Eighteen-time All-Ireland winner Buckley was to the fore as Inniscarra claimed a third straight Cork title against Courcey Rovers. A year ago 12 months Inagh Kilnamona lost the final to Burgress Duharra and will be desperate to atione for that. They've met Iniscarra in the semi-finals for the last two years - and have one win apiece to their names - so they won't be strangers. This Sunday keep up to date with all the club action via our live blog on RTÉ.ie/sport and the News Now app.